CA-125 is an antigen expressed on the surface of a variety of cancer cells, including 80% of advanced epithelial ovarian cancer (EOC), and is targeted by the monoclonal antibody oregovomab.1 Previous studies have shown that oregovomab is clinically active in EOC, and it has been hypothesized that combination with nivolumab, an anti–programmed cell death-1 (PD-1) inhibitor, may elicit a systemic CA-125–specific T-cell response that is synergistic, safe, and clinically efficacious in recurrent (rEOC) patients. 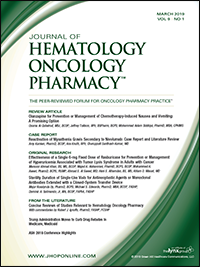 In the ORION-01 open-label, single-arm, phase 1b/2a study, Chan and colleagues treated patients who had received ≥2 prior chemotherapy lines for rEOC, fallopian tube, or primary peritoneal carcinoma with an initial dosage of oregovomab 2 mg every 4 weeks plus nivolumab 240 mg every 2 weeks. All 6 patients included in this study had EOC (4 high-grade serous, 2 clear cell) and had received a median of 4 (range, 3-9) treatment lines before starting the study. At the initial dosage, no dose-limiting toxicities (DLTs) were observed. Treatment-related adverse events included grade 1 events of arthralgia, rash, transaminitis, fatigue, and anorexia. Two of 6 patients (33.3%) experienced grade 1 to grade 2 thyroid-related, immune-related adverse events. Five serious adverse events were observed but were deemed unlikely/not related to study treatment, including 2 episodes of grade 4 sepsis in 1 patient who eventually died of progressive disease. In the current report,1 20 patients from the dose-finding and dose-expansion cohorts were treated at the recommended phase 2 dose (nivolumab 240 mg intravenously every 2 weeks + oregovomab 2 mg intravenously every 4 weeks). If DLT was observed after 3 patients, the dose of oregovomab could be cut in half, then halved again if DLT was observed again in another 3 patients. Between March 2017 and June 2017, 6 patients with EOC were recruited and treated at the top dose level. No DLT were observed. Treatment-related adverse events included grade 1 arthralgia, rash, transaminitis, fatigue, and anorexia; 2 of the 6 patients experienced grade 1 or 2 thyroid-related immune adverse events. Five serious adverse events were observed but were deemed unrelated to study treatment. Given the results of this trial, the initial dosage used here of oregovomab 2 mg every 4 weeks plus nivolumab 240 mg every 2 weeks has been selected as the recommended dose for further study in recurrent epithelial ovarian cancer. Further evaluation of safety and efficacy of this novel combination is ongoing in the ORION-01 dose-expansion cohort. Chan JJ, et al. ESMO 2018. Abstract 979P.